Another crash-strewn finish at the Tour de France put three-time world champion Peter Sagan in the yellow jersey and Geraint Thomas within touching distance ahead of today's team time trial. Bora-Hansgrohe's Sagan held off a late charge from Sonny Colbrelli of Bahrain-Merida to win stage two from a much-reduced sprint after a big crash in the final two kilometres in La Roche-sur-Yon held up the bulk of the peloton. Chris Froome, who lost 51 seconds on his general classification rivals following a tumble late on stage one, stayed upright alongside his Sky team-mates. And with the incident coming inside the final three kilometres all times were neutralised, leaving Thomas only 15 seconds off yellow. Thanks to a bit of quick thinking, the Welshman nicked an extra second with third place on the final bonus sprint, nudging him clear of several rivals. Sky are among the favourites for today's 35.5km team time trial around Cholet. The stage was seen as an opportunity for Froome to make up some of the time lost on Saturday, but victory now could give Thomas another spell in yellow after he enjoyed his first during the opening week of last year's Tour. "We'll try to get the stage win first in the team time trial and then if we do end up in yellow that would be a nice bonus," Thomas said. "But the main thing is go full gas for the stage win and see what we can do." The day had been earmarked for another bunch sprint, but teams had been eyeing warily the final five kilometres of the stage, which included two sharp right-hand turns and long downhill stretches in between for riders to pick up speed. Almost too predictably, a right-hander of 90 degrees-plus two kilometres from the finish had its say as a touch of wheels sent several riders - including stage one winner Fernando Gaviria - crashing to the floor. 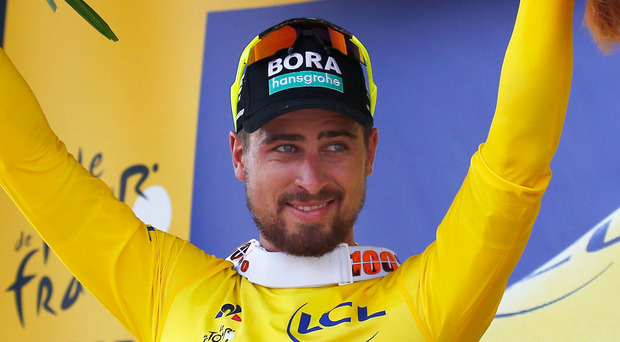 While others were left to pick their way through the chaos, Sagan was in the bunch that got through cleanly, and victory was enough for yellow following his second place on Saturday. Mark Cavendish's hopes of a 31st Tour stage win were scuppered by the crash, though he stayed upright. "It's a common misconception that a sprint day is an easy day," the Manxman said. "There's more stress because everybody is there, whereas in the mountains you've got the climbers ahead and it sorts itself out." By Eddie Hampton Reece Wood (Zappi Team Racing) came through a three-man sprint at Ballymena to win yesterday's stage and clinch the overall Tour of the North victory.